Action adventure game playable at PlayStation Experience 2017. Crossing Souls will launch for PlayStation 4 and PC on February 13, 2018, publisher Devolver Digital and developer Fourattic announced. The action adventure game will be playable at PlayStation Experience 2017 from December 9 to 10. The development team will be on hand to walk attendees through the new demo and discuss the inspirations that went into the project, which include Stand by Me, E.T., and Ghostbusters. It’s 1986 in California and a group of friends will live the summer of their lives after a mysterious discovery in woods outside their quiet town. By uncovering an artifact whose powers they don’t fully understand, these remarkable kids will defy the laws of nature and somehow interact between two planes of reality: life and death. Their curiosity will trigger a series of unexpected events that will get them involved in a government conspiracy and a mysterious U.S. Army general with his own nefarious plans. 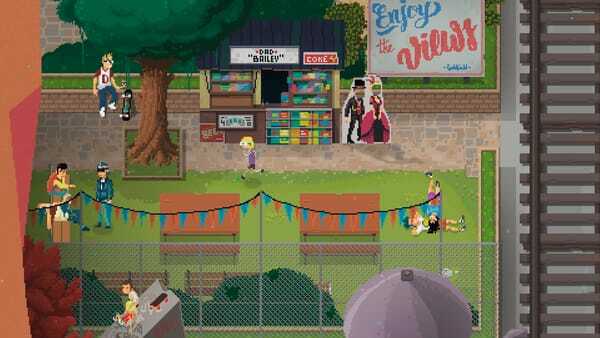 Crossing Souls is a vibrant action-adventure game about a group of neighborhood buddies that set out on a quest to save their town and our world from government conspirators and shadowy forces. Switch between these unassuming heroes on the fly to take advantage of each one’s unique attacks and abilities as you battle local authorities, evil specters, and creatures of unknown origin! Collect clues from around town and jump between two realms to solve the mysteries enveloping your quiet suburban home before all is lost! A Brave Group of Friends: Lead a group of neighborhood friends on the adventure of a lifetime and alternate between each one to take advantage of their unique attacks, abilities, and personalities to overcome any obstacle or opposition on your journey! Interdimensional Puzzles: Solve head scratching challenges by mixing the group’s abilities with the Duatstone to jump between the realm of the living and the realm of the dead, interacting with the inhabitants of each…both friend and foe! Some Small Town Excitement: Explore a small California town at the center of this epic conflict and uncover new and exciting areas as your adventure unfolds. Get lost in the woods, snoop around the local arcade, and traverse the once quiet streets of suburbia to discover the secrets that have been hidden there all along. A Fantastic Cast of Characters: Interact with everything from cavemen and cowboys to librarian ghosts and even dinosaurs by jumping between our world and the realm of the dead! Some hold clues while others want to end your quest where you stand!